The Clinique has lots of concealers which look like they are good for black and brown skin plus Clinique concealer was recommended to me. My main aim is to save time so I wanted a one-step concealer for under my eyes only, rather than having to colour correct then conceal. I booked an appointment at my local Clinique counter and Clinique All About Eyes Concealer in Deep Honey 08 was matched to my skin colour. As well as giving me the colour correction and coverage I need in one product, I can apply this with my fingertips. There is no need for a brush as it comes in a squeezy tube. If it was a pot I would have to use a brush – there’s something about dipping my fingers into a pot every day that I just don’t like! It’s easy to build the colour to get the coverage I need – I can have a very light coating or I can add a little more. There’s no need to set it with power which eliminates that step, although I can set it if I’m going for a super matte look. Without powder it looks more natural. Only the tiniest amount is needed, and I mean tiny, so this will last for a long time. The one downside I have noticed recently is that although I use it everyday, it does separate so sometimes I get clear oily liquid instead of concealer which is annoying. Even after shaking it doesn’t always mix. If this didn’t happen, I would have said it is the perfect concealer. 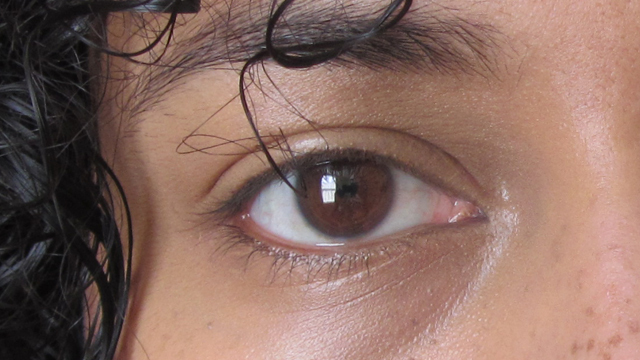 As an added benefit, I was told the All About Eyes Concealer contains caffeine which reduces dark circles and puffiness. Now, I didn’t expect all of my cosmetic eye issues to be reduced completely or there would be no need to buy concealer. I do have to say that I have noticed that the circles are not so dark and my eyes are not so puffy, so maybe the claim is true. I would probably buy this again as I am so pleased with the perfect colour match and the feel of it – the formula is great for me. It’s also such a time saver not having to use a brush, powder or corrector. The price wasn’t too bad either! 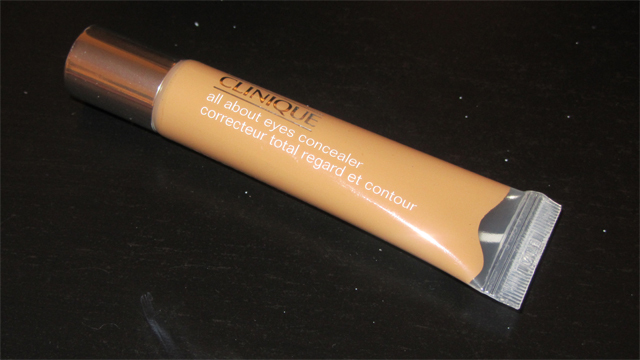 Clinique All About Eyes Concealer in Deep Honey – spot the dark circle!